Cosmic Fortune is one of those slots that put the other slots in its long shade. With lush graphic design and a highly rewarding gameplay, Net Entertainment provides one of the best slot experiences in recent memory. This is a game that gets full marks in all areas and aspects. The premise of the online slot is an action-filled one. A city has been attacked by aliens. As they overrun the defences, a young hero leaps out of his car, takes over one of the spaceships, and begins to shoot down the aliens using their own weapons. The game never slows down from here, offering you the very best in entertainment and excitement. The very first thing that will catch your attention is the gorgeous visual design. Suffice it to say, the slot looks as good as, or even better than, a video game. The theme has been rendered in high definition graphics, and a visual palette that is both sleek and stylish. The backdrop appears in a soft focus while the symbols are arranged across five reels in the form of bubbles. 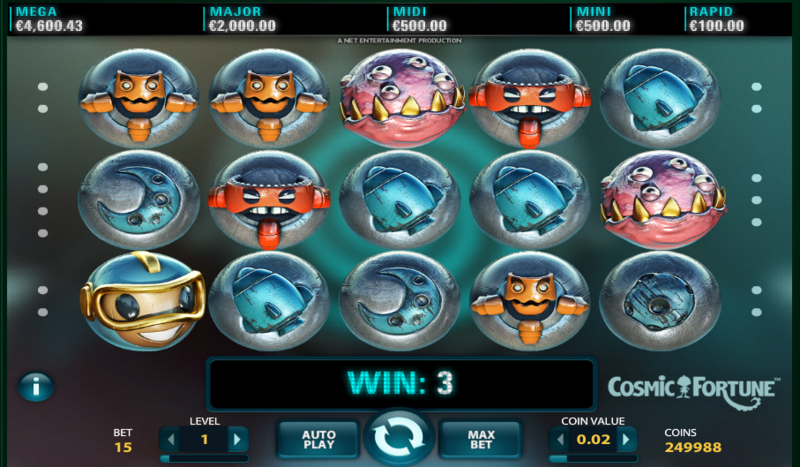 These bubbles light up with in eye-catching animation when wining combinations are struck. It seems that the developers at Net Entertainment have spared no effort in making Cosmic Fortune one of the most rewarding slot experiences. You stand a chance to play not one, not two, not even three, but five different jackpots with one single bet. And it gets even better. Out of the five jackpots, three are progressive, which means that your win potential in practically unlimited. Not content with doling out five bonuses, Net Entertainment has gone forward and included other special features in the game. The most attractive among them is the bonus game of Free Falls. This is triggered when the regular Free Spins feature ends. Here you will find two Jackpot bonus game cups, three Coin Win cups, and six Collector cups. A space craft hovers over these cups, dropping marbles that you have accumulated in the Free Spins round. If a marble hits a Coin Win cup, you are paid a cash reward equivalent to the bet level you are at. If three marbles gets in a cup of Jackpots, then player enters the jackpot rounds and a chance to win the big prizes. Cosmic Fortune does not disappoint in any regard. It is a creatively designed and hugely rewarding offering from Net Entertainment.